Scotland’s participation in the 2015 European Curling Championships is under way, with two opening losses being followed by two victories. Team Muirhead (Eve Muirhead, Anna Sloan, Vicki Adams, Sarah Reid) began their campaign against the hosts Denmark on Friday, and suffered a slow start. Lene Nielsen’s Danes scored two in end two before a steal of two in end five gave them a 5-1 advantage. From there the Scots were always going to struggle, and after Denmark scored another two in end eight they conceded the match at 7-2. Saturday morning also saw a Scottish defeat, this time Team Smith (Kyle Smith, Thomas Muirhead, Kyle Waddell, Cammy Smith) going down to the 2015 World Men’s Championship runner-up, Team Ulsrud of Norway. Norway sprinted into a 5-0 lead after four ends, Scotland got on the board at 5-1 after five but then Ulsrud’s hit and stay scored five in end six and it was effectively game over at 10-1. Smith succeeded in taking three from end seven, but then conceded the game after Ulsrud took one in end eight – Norway winning 11-4. Scotland’s first win of the Championships came in some style – Team Muirhead recording a comprehensive win over Cissi Östlund of Sweden, 11-3. Sweden scored a single in end one but Scotland took control with a four in end two and a steal of two in end three. The teams traded twos – so it was 8-3 Scotland after five ends – before Sweden gave up further steals in ends six and seven, meaning handshakes at 11-3. Team Smith also knew they needed a win, and they got it against the Czech Republic, though it was a tough battle against David Sik’s rink. The Scots scored two in end one but found themselves 4-3 down after five ends. The game remained finely poised until the 10th end, as the Czechs left themselves open to a hit from Kyle Smith which scored three and won the game 9-7. Elsewhere in the A-Division round robin, Denmark and Russia lead the women’s standings with two wins apiece – Anna Sidorova’s Russians having beaten Switzerland 8-2 in their opener. 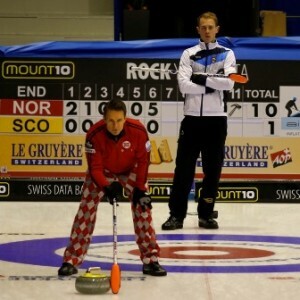 As for the men, Norway lead the way on two wins alongside Alexander Baumann’s Germany – who defeated holders Sweden 7-6. Switzerland are struggling, having lost two from two. And of course there are B-Division matches going on as well in Esbjerg – which started on Thursday. England women, skipped by Anna Fowler, began with a 9-7 win over Italy, but were then on the wrong side of narrow defeats to the Czech Republic (8-6) and Turkey (10-9). Alan MacDougall’s England men opened with a 7-5 victory over Estonia and then slipped to an 8-4 loss against Israel; Wales men (skipped by James Pougher) defeated Slovenia 7-3 but then lost 9-3 to Turkey. Stay tuned to the Roaring Game Blog for daily updates, or check out CurlingGeek for stone-by-stone scoring – tomorrow’s games including Smith v Edin and Muirhead v Sidorova. For all the live scores from Esbjerg, see the World Curling Federation page here, or here for the B-Division games. For photos, see the WCF galleries here.